A common name for this species is Stunted Sheoak but we feel that a more appropriate title should be Dwarf Sheoak. Allocasuarina nana is a small, dense shrub that will reach a height of less than 1.5 metres. The leaves are reduced to whorls of teeth around the stem. The Dwarf Sheoak has 5 to 7 leaf-teeth in a whorl. Allocasuarina nana is usually dioecious (male and female flowers on separate plants). The male flowers are carried in spikes on the ends of branches. When the flowers mature, pollen is released and spread by the wind. Female flowers are in globular heads on short stalks along branches. Pollinated female flowers develop into persistent, woody, globular cones. 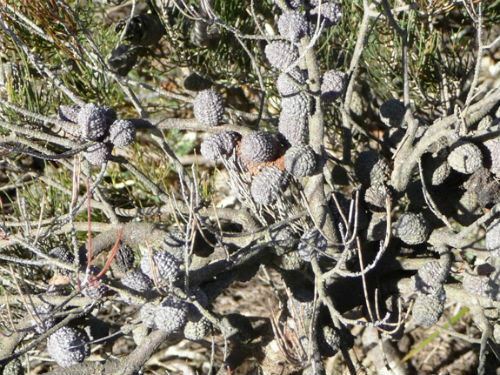 Each cone contains many small, winged nuts or samaras. As may be seen from the thumb nail image pollination is very efficient. Allocasuarina nana is an attractive small shrub that could be grown as a foreground plant in a native garden bed. The Dwarf Sheoak could also be used as a low, informal hedge in the larger garden. The species would make an excellent native substitute for the ubiquitous, slow-growing English Box in this situation. Allocasuarina nana occurs in New South Wales and Victoria and usually grows in sandstone areas. The specimen illustrated is growing in the Box Vale Reserve near Mittagong in the Southern Highlands of New South Wales. 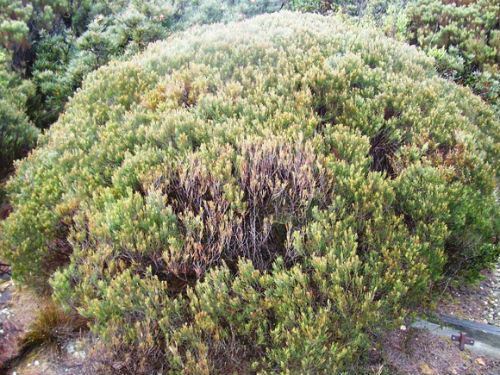 We have also observed the Dwarf Sheoak growing in the Blue Mountains of New South Wales and in Deua National Park in southern New South Wales. In this latter location Allocasuarina nana covers hillsides and is the dominant understorey shrub. The type material may have been collected in the Blue Mountains or possibly the Royal National Park, Sydney.